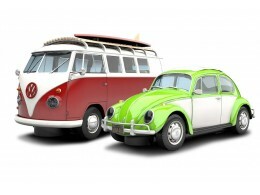 VW Beetle 1963: The Volkswagen Beetle was designed as a practical, durable and affordable car in Germany in the 1930s. By the 1970s it had reached cult status and was popular all over the world. The Beetle was often converted for leisure pursuits and was a must-have vehicle for the out-door activities. VW Camper Van Type 1b: With its fold away bed, table, sink and cooker, the Volkswagen Camper, or bus in the US, has been the starting point for many an adventure. First built in 1950, the popularity of the Type 1b reached its peak in the 1960s. Today, these early classic models are as popular as ever.